← Nothin’ Says Lovin’….. like homemade Bread! Like the title says, I am losing what little of my mind there is left. Fast. I went to order a new batch of 10-grain bread mixes the other day at that big online store in the sky, where Prime rules… and last night I got the box. I ordered 3 cartons of 4-each, so that’s 12 packages of it. 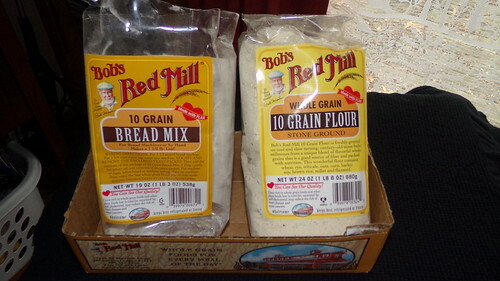 Paul goes thru this 10-grain bread mix from Bob’s Red Mill quite fast, one every 4 days to be exact, so I wanted to stock up. Well, as you can see below, the one on the left is the last of the old mixes I just used up today, and the one on the right is one of the new ones that arrived yesterday (of which I now have 12). Where is my brain lately? I had been looking around for bread mixes for a while that day, and I also had ordered some sourdough mixes for myself, so probably when I saw the 10-grain I just clicked – without looking closer. This is 10-grain flour, not bread mix! I do have a recipe to follow, in the bread machine cookbook. There’s one called BASIC HONEY WHOLE WHEAT BREAD that I think I’ll try for his next bread, in 4 days’ time. All I’ll have to add is this flour as well as water, salt, unsalted butter, honey, and yeast. Not too bad, huh? So really, not too many extra items. But I need to get some new yeast because I think the yeast that I keep in the door of the fridge may be too old. Not sure. Better to be safe than sorry. New yeast it is, onto the shopping list! I’ve just put a loaf into the oven (using the bread machine to do the kneeding/rising bit and then transferring the bread to a loaf pan)… so the house will soon be smelling yummy again. The older I get, the more stupid things I do like this. I don’t pay attention to every little thing. I made a batch (it’s my 3rd batch) of that glorious TUSCAN CANNELLINI BEAN AND KALE SOUP that I told you about a while back. I keep thinking that each new time I make it, it won’t be as good as that first batch was, but I would be wrong there! 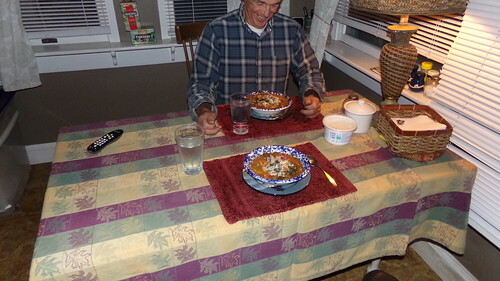 It’s been perfection each time, and last night’s soup was no different. Wow, that is the best soup I think I’ve EVER made or eaten. No meat in it, just the beans and the lovely kale and veggies, etc. If you want the recipe, I’ll try to locate it now for you. It’s quick and easy to make, as well. I started mine last night at 4 and by 5:15 we were eating it. Besides all the goodness of kale, the cannellini beans in this soup make it an excellent source of protein and fiber. Heat olive oil and saute the onion, celery, carrots and rosemary over low to medium heat for 5 minutes, stirring frequently. Add garlic and cook another minute. Add tomatoes, vegetable broth and bay leaf. Bring to a boil then reduce heat, cover and simmer for 10 minutes. Wash the kale well, removing and discarding the center stalk before slicing. Add sliced kale and 2 cans of beans to the pot, bring back to a low boil and simmer, covered, until kale is tender (about 5 to 10 minutes). Turn off the heat, remove bay leaf, add lemon juice and salt and pepper to taste. OK. Paul’s home. I’ll have to tell him the whole long story of the bread/flour saga… wish me luck! The bread flour will be a bit more work to transform into bread, but you never know, it might be even better than the mixes. You won’t know until you try. The soup sounds yummy! I am no lover of kale, but this soup recipe could change that. Are you sure that you’re the one who made the mistake, Bex? Could be Amazon made the mistake. I have noticed that you can go to your Orders page on Amazon and then select Re-Order from there, so you’re sure to get the right item. Bex, I’ve done similar things often enough. Frustrating, but okay when it’s something you can work around, as you’re planning on doing. But hey, I put up my two “feel-good-trees with lights” yesterday. They were in a brown paper bag in the basement and all I did was plug them in. That’s as far as I’m willing to go in the holiday decorating department. I have one in the Reading Room that is multi-color lights and one in the Living Room that is blue/green/white lights. Cosy. I’ve done things like that too. With me it is fading eyesight. The bread you plan to make sounds good. I keep meaning to make that kale soup as I have kale here all the time for a smoothie. Maybe tonight! Looks like you have some snow…..